Amsterdam is usually associated with tree-lined waterways, cyclists and fresh air. But the Dutch capital actually has a surprising pollution problem. The city was given a D+ ranking for air quality by an environmental study last year, thanks in part to its failure to implement a low emissions zone for private vehicles, as other European cities have done. Now one local designer has a plan to tackle the problem: Joris Lam has designed a series of tree houses that light up and emit free Wi-Fi when air pollution levels fall to a healthy level. Tree Wi-Fi, as it's called, aims to incentivize people to make more environmentally friendly choices. "I wanted to make something that measures air pollution locally and also makes the issue visible in an understandable, human-centric way," Lam said. A recent study by Milieudefensie, the Dutch arm of environmental organization Friends of the Earth, showed that air quality in 11 urban areas of the Netherlands, including Amsterdam, regularly falls below optimum European standards. Lam -- who has a background in digital media and design -- says that while broad data like this is readily available, a lack of localized data inspired him come up with the idea for Tree Wi-Fi. "I wondered what that [data] actually meant for me personally," he says. "So I set out on a quest to find out what the air quality in my street is like and quickly found out there's not really a simple answer to that question." Because the Amsterdam authorities only measure air quality in a small number of locations throughout the city, and because air pollution often can't be seen on the street, he realized the problem is essentially invisible to the average citizen. "Air quality monitoring stations from the municipality look like anonymous strange little buildings with bells and whistles sticking out of them that don't make you any wiser," says Lam. Lam set to work, and after "four months of little sleep and tots of tinkering, coding and soldering," Tree Wi-Fi was born. 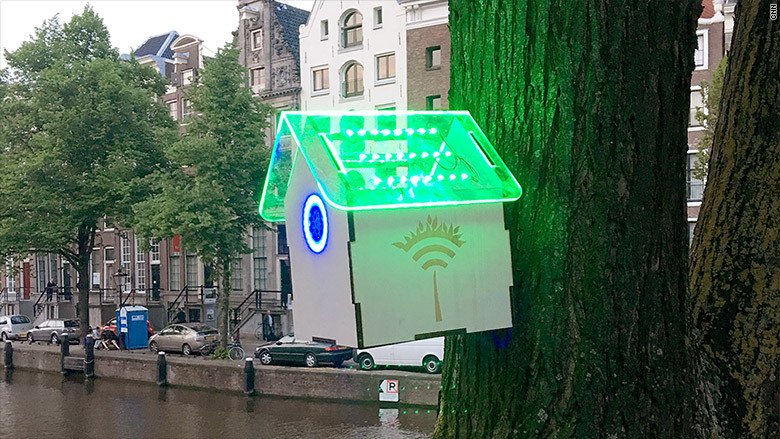 Designed to look like a birdhouse, the Tree Wi-Fi device is harnessed to a tree and contains sensors that measure air pollution levels emitted from combustion processes -- i.e. fumes from cars and trucks -- within about 100 meters. Every evening, the day's air pollution data is sent from the birdhouse to a central server where it is analyzed. The results are then sent back to the birdhouse, where -- if good enough -- they trigger internet connectivity. 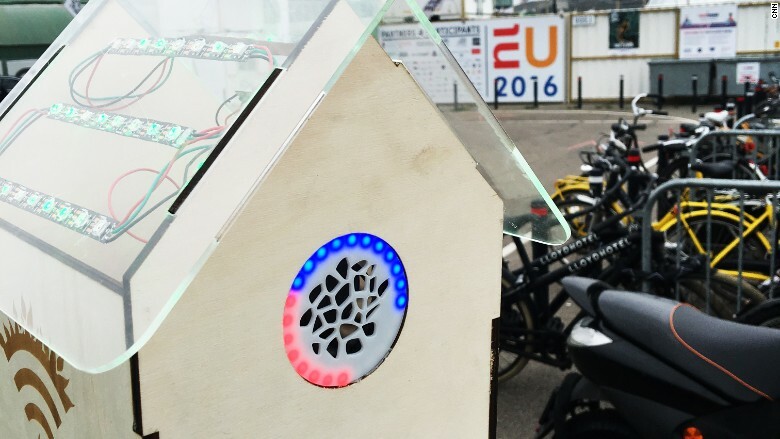 "When the server detects a decrease in pollution compared to the day before, it opens up the internet connection the birdhouse has for everyone to use," Lam, explains. When air quality reaches an acceptable level, the tree houses light up and release free Wi-Fi. "The Wi-Fi network itself is always available for people to connect with, regardless of the air quality, but if the air quality is poor, instead of free internet it gives information and tips on how to improve air quality." The readings also trigger changes in the LED lights on the device, which give residents an instant visual measure of air quality. "It also provides scientists with very detailed and valuable data about air pollution and the way pollution works in urban environments in real time," Lam adds. The device is just in the prototype phase right now, but it has already attracted the attention of Amsterdam government officials. Lam has raised enough money to assemble a team of seven engineers and scientists to refine the technology and reward system. Other rewards in the pipeline include giving free Wi-Fi when someone downloads an air quality report and talks to the local government about it, or when someone submits a plans for community action. "We currently have a lot of interest from other countries who want to roll this out, so when those deals start to become clear we will [structure ourselves] in a way that fits our international ambitions," says Lam.